CK and Nate header: TBT Sunroom: Reveal! Don't forget! Tomorrow is the last day to enter to win a chandelier or rope pulls! And now for my favorite type of post: Before and After!! 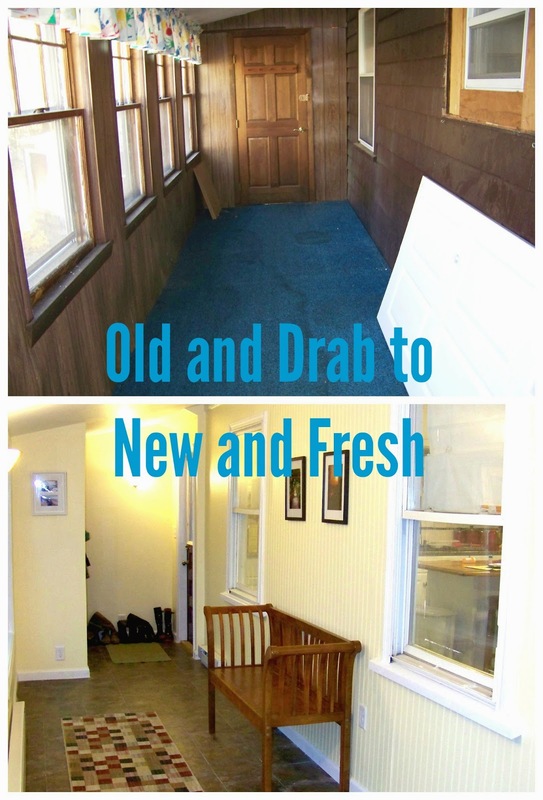 Over the last month we've been going back over how we transformed the sunroom in our first house a few years ago. What started as a bit of rotten paneling turned into a complete gut, tear-down, and rebuild. In addition to all of the structural changes, we also did a much better job insulating and we installed some electric baseboard heat . This was an easy way to get the right amount of heat into the new space since it wasn't originally a heated room. It required a separate thermostat, but we were able to get a wireless one so that was actually pretty easy. We also were able to use the end of this hall as a coat room, since the one in the living room had been turned into the most convenient laundry room ever! This may have been a small space, but the amount of work it took really brought our skills to a new level. After replacing the exterior wall and building it back we were able to complete redesign this space into something much more useful. It was exhausting just looking back at all of this, but it was a huge moral victory as well!